Anchorage – Tomorrow, Alaska Governor Bill Walker will sign legislation designed to increase economic opportunities for Alaska farmers and fishermen and to grow Alaska’s farm-to-table economy. House Bill 217, sponsored by Representative Geran Tarr (D-Anchorage), will be signed at noon on September 5 at the nonprofit community garden near the Mountain View Elementary School in Anchorage. House Bill 217 strengthens incentives for the State of Alaska, school districts, and municipalities to buy more “Alaska Grown” products. The bill also encourages the tourism practice of exploring Alaska farms and provides long-sought receipt authority for the Alaska Division of Agriculture to sell products with the Alaska Grown logo to support of Alaska farmers. “Alaskans and visitors to Alaska deserve healthy, Alaska Grown foods, and this bill opens up additional opportunities to expand markets,” said Rep. Tarr, who represents Mountain View, Russian Jack and Airport Heights neighborhoods in northeast Anchorage. Alaskans spend $1.9 billion every year on food produced outside the state, making the state vulnerable to shortages and supply interruptions. In recent decades, small farms have begun to raise foods to sell directly to consumers – mostly at farmers markets. In 2005 there were 13 markets in Alaska. That number has grown to nearly 50, with additional opportunities through an online farmers market called Alaska Food HUB. These direct sales rose 32 percent from 2007 to 2012, and now stand at 13 times the national average. Nearly one of every three farms in Alaska sells direct to household consumers, placing Alaska among the top states in direct sales, along with New Hampshire and Vermont. “Every dollar spent on Alaska Grown food supports Alaska entrepreneurs and businesses. Each of us has an opportunity to increase food security,” said Tarr. House Bill 217 passed the Alaska State Senate in May by a unanimous vote of 18-0. The bill passed the Alaska House of Representatives in April by a vote of 37-2. 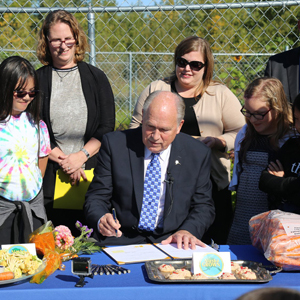 The public is invited to attend Wednesday’s bill signing ceremony from noon to 12:30 p.m. at the nonprofit community garden located on McPhee Avenue between N. Pine Street and N. Lane Street in the Mountain View area of Anchorage. Address: Room 128 Capitol Bldg.